My mother purchased a what she thought was Dooney and Bourke hand bag some time ago for me. I have no idea if it is real and just want to see what you think about it. I know it said to not attach pictures without you asking for them, so if you would like to see pictures that would be great. After looking at your website I believe it fits in with handbags made in another country. The tag has Dooney & Bourke, INC. but no tag saying where it was made. It would be great to find out if it is real! We contacted Dooney & Bourke about similar bags we have had in the store and here is what they told us. Here is an example of a back pack we have in the store at this time. Would you check to see if there is a sticker on the back of the inside pocket? And tell me what it says……..also, if you could send a photo showing the entire inside of the bag. Just open it up empty and shoot an overhead photo. Thanks ! Courtney wrote to tell me that the rivets used on this bag are stamped Dooney & Bourke and sent me a photo of the inside pocket. So I looked through all of my catalogs and although I found that the Small and Medium Totes look a lot like this bag, there are a few things that don’t look the same. Courtney’s bag is much narrower at the bottom that it is at the top. The totes in the Dooney catalogs are the same width top to bottom. Also, I am not familiar with this style of inside pocket. Courtney’s bag looks like it is made from a type of pebbled leather but the only totes that were similar to Courtney’s were made of smooth glove leather. So I can not give a definite answer on this bag although my gut feeling is that it is made by Dooney & Bourke for a certain outlet such as mentioned in the beginning of this post. Small Tote: 8″ tall x 7″ long x 4 1/2″ deep and sold for $135 in the early 2000s. Medium Tote: 11″ tall x 10 1/2″ long x 6″ deep and sold for $175 in the early 2000s. The closest we have had in our store is the Small Shopper in All Weather Leather. It does have some things in common with Courtney’s bag but it has many features that are different. This entry was posted in All Weather Leather, Authenticity, Made in USA, Registration Tag, Tote and tagged all weather leather, authenticity, AWL, Dooney, Dooney & Bourke, tote, vintage Dooney by Native American Jewelry Tips. Bookmark the permalink. I actually just got a bag quite similar to the original post off ebay, though made of nubuck leather instead of the traditional pebbled one. The accompanying fob states that it is an AWL, though, and the straps/buckles/etc features are the same as the customer, including the lower bag part branded with the cursive and all. It also has the Made in USA tag with a serial number and dimensions of approx. 10.5 x 10.5 x 5. 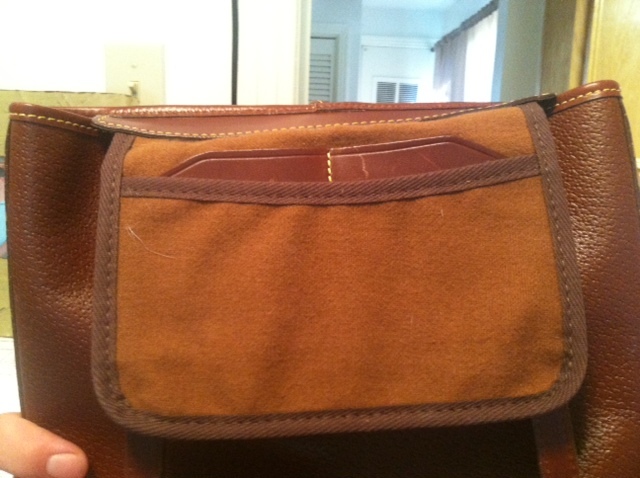 It doesn’t have the inner flap small pocket compartment thing though, it’s just one big space with unlined suede/leather. The seller told me that she used to work at Rich’s (now Macy’s) in the early 1990’s and that she purchased this bag there for what at the time retailed as $300. Hope this may help give some kind of extra reference which may relate to your bag? Thank you for your posts! Does anyone know the NAME of the bag Courtney wrote in about? the brown bag? I had one just like it, decided it was too small and gave it away. but Im looking NOW for a LARGER black one. I know it was years ago, but.. I think I got mine at Dillards, or Macys, not sure, and paid 2 hundred and something to 3 hundred dollars for it? thanks!